One of the things I've noticed on my daily commute here in Edmonton is the amount of love that Oilers defenceman Kris Russell has been receiving on the airwaves - it's non-stop. Callers and commentators alike can't stop mentioning his supposedly superb play. And they don't stop there. Discussing Russell's stellar play, you see, is a perfect opportunity to segue to a let's-bash-analytics fireside chat. Unfortunately for all those who have used Russell as the shining beacon of all things anti-number, the D-man's on-ice success likely isn't all that sustainable. While some in Edmonton are already calling for the Oilers to offer him a rich, multi-year extension, it's worth remembering that it's probably not a coincidence that he didn't get such a contract this past summer even with so many teams clamouring for rearguard help. Before delving into some basic analysis, it's important to step back and really consider what "analytics" represent. So often in the hockey world they are treated like some mystical number created by a spreadsheet with no tangible connection to the real world; that couldn't be further from the truth. At the end of the day, analytics are simply measurements of actual on-ice results. They measure the things you're watching at home on your television or hearing on your radio. It's no different than counting shots on goal, or hits, or fans in attendance. Now, it's true that analytics don't always paint the full picture. Consider a game of golf, as an example: You might scramble really well and save par, when you really deserved a bogey. The par will show up on your scorecard, but is it really indicative of how you played the hole? Alternatively, you might get unlucky and have to take an extra stroke, resulting in a bogey when you should have had par. The numbers don't paint that picture. But, on the other hand, how many times have you shot a 75 knowing that you played at a 95-stroke level? How many times have you shot 95 and walked off saying that it should have been a 75 with the way you were striking the ball? It doesn't happen often. The point is that, while in small sample sizes the numbers can be a little bit misleading, over the long-term these things tend to even out. Exhibit A: The Oilers are getting legitimately caved in whenever Russell is on the ice at even strength. There's a bunch of hype about him making smart hits, blocks, and stick plays because, well, his team is never the one taking shots when he's out there. 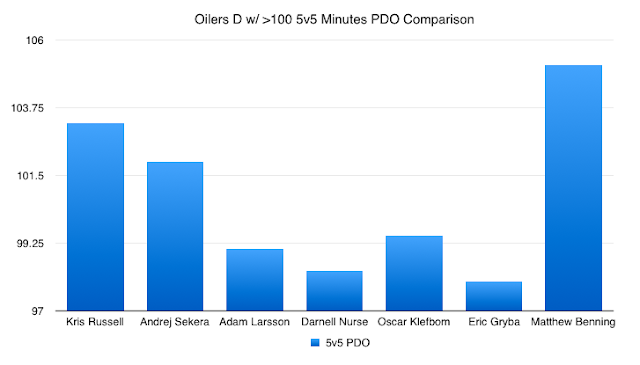 That PDO isn't built on a stellar on-ice shooting percentage, either. Rather, it's built on the crazy on-ice save percentage he's been rocking thanks to lights-out play from Cam Talbot. Russell's 5v5 on-ice save percentage is 96.33%, which ranks first overall amongst those seven Edmonton D-men and sixth (!) overall in the NHL as a whole. Consider that Russell's cumulative on-ice save percentage over the last four seasons (2013-17) is 91.86%. The odds that his current year mark remains in that crazy elite sphere is highly unlikely, and that's through no fault of his own. Most goaltenders just aren't going to stop the puck at that rate all year long. In short: When the puck starts finding the way to the back of the Edmonton net when he's on the ice, don't be surprised. The lower the dark bar, the better. The higher the light bar, the better. 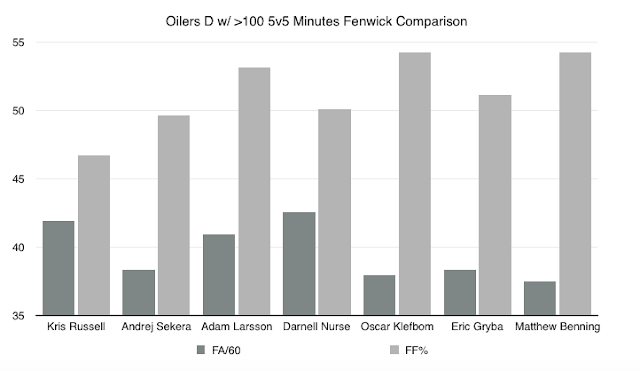 Russell's Fenwick numbers don't point to some amazing shot blocking skill that makes the Oilers markedly better. Still not convinced? Per Corsica.Hockey, Russell is ranked second last on the Oilers' defence in SCF% (scoring chances), and dead last in xGF% (expected goals for). There will be fall, and the potential for it to be fairly monumental is certainly there. People can laugh off the numbers all they'd like, but with this much smoke am I really supposed to believe that there isn't a fire coming? While I'm obviously not as high on Russell as many in town, it's not like I have some vendetta against him or what he brings. There have been some positives. 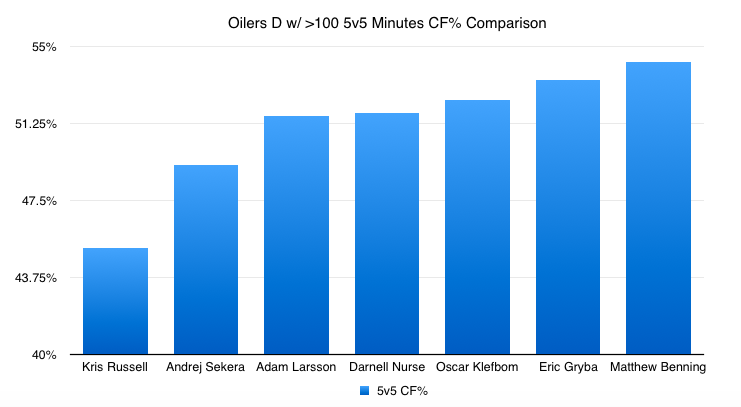 The reality: Edmonton's defence was really, really bad prior to this season. It needed some serious help. While Russell is obviously nothing more than a depth piece, he has done some good things in an Edmonton jersey (albeit not typically at even strength, as highlighted above). Consider that 126 defencemen have played at least 25 shorthanded minutes to start 2016-17; it's an admittedly small sample size, but it's all we have. Among those 126, Russell ranks 69th in CA/60. He's done a relatively average job of limiting opposition shot attempts while out on the PK. For an Edmonton team that has struggled so mightily on the back end in recent years, that's not a bad thing at all. It's... average. And that's better than Edmonton has been on so many nights since I moved to town. The flip side, though? It's also easily replaceable. My point here is this: Russell is not the defenceman that so many around town seem to think he is. 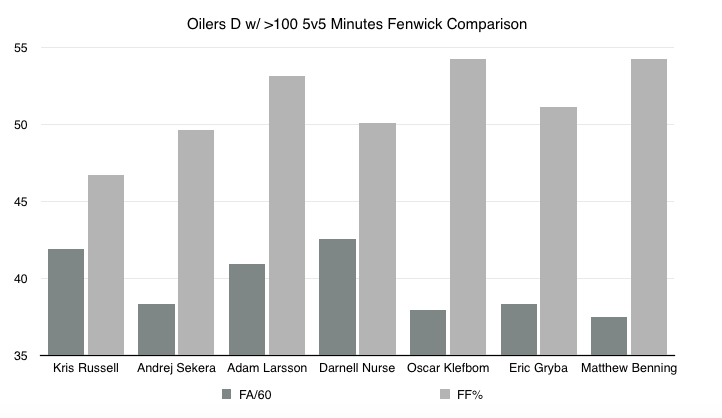 Instead, he's a depth guy who isn't going to do anything particularly special on the ice for this Oilers group. In a lot of respects, he should be viewed as a placeholder while Peter Chiarelli continues to rework the back end. He should NOT be a guy who receives a rich, multi-year deal. So, how many years and how much for Cam Barker, Edmonton? Five years? $30-million? Those results seem to speak for themselves.